It's pretty ugly, right? Amusingly so, but I'm counting my lucky stars that the kitchen didn't get a late-eighties renovation or even a more recent change because I'd tear it all out anyway. The brown and yellow kitchen has lived a good life but it will shortly make way for a more modern (and less potty-inspired) look. In honor of the history of this crazy, once-popular color combination, I wanted to dedicate a post to the brown and yellow kitchens of yesteryear. Enjoy. This kitchen is "tasteful"? I beg to differ. These pictures (and our kitchen) prove that not all trends should be resurrected. Let the brown and yellow kitchen die. Stay tuned for updates to the space! Ha, you're so funny! Thanks for that stroll through the kitchens of my childhood. And can we forget all the avocado green appliances too? I think my parents still have our brown refrigerator in their garage storage area. Nice. "Potty-inspired" was hilarious - I never thought of it that way. Can't wait to see your mod Ashley makeover. It will be a show-stopper for sure! I think you've made it pretty cute already! You are going to love every minute of redoing it - and I always prefer to do my own thing over living with someone else's upgrades! Some of those pictures completely remind me of our kitchen growing up!! I love it!! Ashley, your kitchen is so cute! Seriously, you've really made it so cheery! I love the yellow and green together. I have to say, I kind of love the yellow and white stripe floors and flowered ceiling of the top right image! 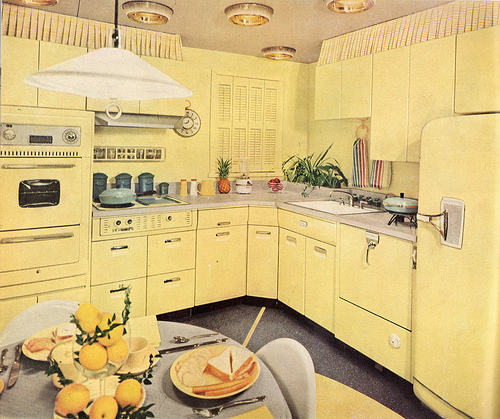 But no, I would not love a brown and yellow vintage kitchen of my own. Haahaha! Our current house was all brown (including trim) on the exterior with yellow door and shutters when we moved in. (inside wasn't much better) Feel your pain girl, I just give thanks to paint on a daily basis. I'm sure it is gonna be fab! P.S.- It scarred my kids though... when we now pass other brown and yellow houses they say, "hey Mom, we used to have a poop & pee house"..lovely. Oh no! Ha. I am sure it will be fun to put your own stamp on it. You managed to make it look pretty good though! First of all, look at the glorious, glorious light in your house! Wow! Second, you are hilarious. 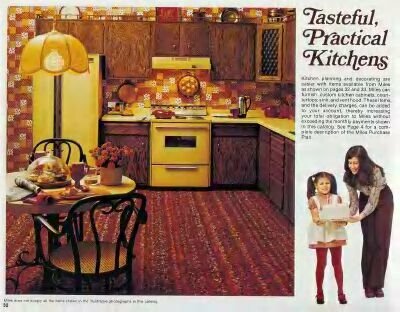 I'm amazed you found all of these great images of the seventies kitchen (that photo of the mom and daughter could be my mom and me many, many years ago). Third, I can't wait to see what you do to the space. Since you couldn't touch your old kitchen, I'm betting you become kitchen obsessed, as I did. Last, I actually quite like the yellow -- just not with the brown. Will there be an full overhaul or an intermediary step? So fun to see your pretty stuff in your new kitchen! Hope your move went well. AND so excited to see what you guys do to this kitchen long-term! The images you found really put it all in perspective. 60 years from now someone will be tearing out an all white cabinet and marble countered kitchen saying, "This is awful! What were the previous owners thinking!?!?!" what do you store in that giant apple?! and where is it from?!! so cute. Hi, Jennifer! I bought the large apple jar at an antique shop in my home state of CT. I use it to hold tea right now but it could certainly double as a cookie jar, too!